Movie Review: After the experience gained with TV series, Jeremy Lovering’s first feature reveals to be a simple but watchable horror film that relies on the same old techniques to impress. After making a stop (shrouded by mystery) in the unique pub of a remote Irish city, Tom and Lucy hit the deserted and mazy country roads with the intention of finding a house hotel. Driving in circles and running out of gas, the couple’s apprehension and uneasiness will be noticeable in their facial expressions when the night falls, spectral appearances start to occur, and an uninvited guest joins them to give every indication. The concept is far from being new, but the film gains some points by causing some chills and excitement through nocturnal images of the roads surrounded by woods, only illuminated by the car´s lights. The doubt about what happened in the pub and the uncertainty of what’s coming next never abandoned me, with the question if the threat was coming from this world or from another starting to emerge in my head. 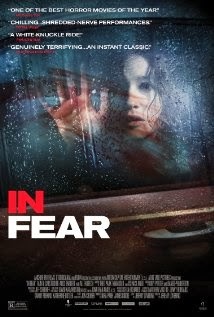 Minimal in terms of plot and execution, sparse in intentions, and evincing an efficient camera handling, “In Fear” makes of ambiguity its better tool to scare, well sustained by dim light images and a balanced alternation between silences and music. Considering the low budget and minimum resources, the film partly succeeds, even not unclasping the habitual stereotypes of the genre.